Exhibition Of Paintings By P J Stalin is an event that took place between 01-Jan-2007 and 10-Jan-2007 in Hyderabad. It might be hard to suppress an expression of admiration when you see his latest. He'll probably merely be polite - he's been told too many times now. An exhibition of paintings by P J Stalin is on at Gallery Space from 1st to 10th January. The paintings with oil on canvas and numbering about 32, are all abstracts based on geometrical expressions, with some having a girl or woman in the background. Stalin studied at the S V College of Fine Arts, and later got his Masters degree from the Hyderabad Central University. 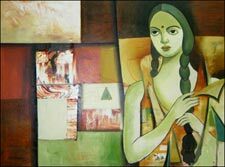 He has exhibited at the Hyderabad Art Society, the AIFACS, the Camlin Art Gallery and the Telugu University. He has also participated in various group shows and art camps. Stalin is a recipient of numerous awards, and his collections are housed in the Hyderabad Central University, the Telugu University, Virchow Laboratories and in various private collections. He was honored with the Rajaji Award in 1997, the Konaseema Chitra Kalaparishad Award in 1998, the Hyderabad Art Society Award in 1999 and the Telugu University Award in 2002. For further details, please contact the art gallery at 6554-1836. Be the first to comment on Exhibition Of Paintings By P J Stalin! Just use the simple form below. fullhyd.com has 700,000+ monthly visits. Tell Hyderabad what you feel about Exhibition Of Paintings By P J Stalin!